Every Kimpton hotel tells a distinct story. The story of Kimpton Hotel Palomar Philadelphia is Art in Motion; and before you even set foot in the magnificent lobby; youll know precisely why. The hotel itself is one of the citys most striking examples of Art Deco design - a landmark 1929 building that has been restored to its original grandeur and beyond. 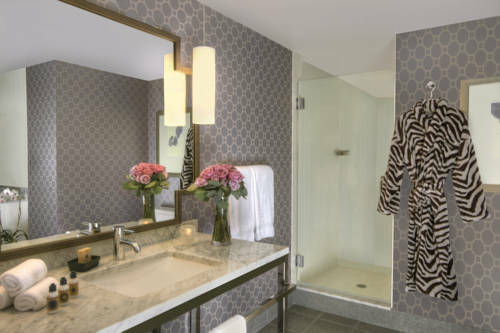 The Kimpton Palomar Philadelphia is now the citys only LEED Gold Certified eco-friendly hotel. Here you will enjoy an ideal location in the heart of Center City within the trendy Rittenhouse Square neighborhood just steps from all of Philadelphias finest attractions - Rittenhouse Square Park; Old City Philadelphia; the Mutter Museum; Philadelphia sports attractions and high-end boutique shopping. Wright Meeting Room: The boutique Hotel Palomar Philadelphia, a Kimpton Hotel, offers an artful setting for your next Philadelphia meeting or social event. Pei Boardroom: The boutique Hotel Palomar Philadelphia, a Kimpton Hotel, offers an artful setting for your next Philadelphia meeting or social event. Abel Meeting Room: The boutique Hotel Palomar Philadelphia, a Kimpton Hotel, offers an artful setting for your next Philadelphia meeting or social event. Burnham Ballroom: The boutique Hotel Palomar Philadelphia, a Kimpton Hotel, offers an artful setting for your next Philadelphia meeting or social event. Cret Meeting Room: The boutique Hotel Palomar Philadelphia, a Kimpton Hotel, offers an artful setting for your next Philadelphia meeting or social event. Wright A: The boutique Hotel Palomar Philadelphia, a Kimpton Hotel, offers an artful setting for your next Philadelphia meeting or social event. Wright B: The boutique Hotel Palomar Philadelphia, a Kimpton Hotel, offers an artful setting for your next Philadelphia meeting or social event. Cret A: The boutique Hotel Palomar Philadelphia, a Kimpton Hotel, offers an artful setting for your next Philadelphia meeting or social event. Cret B: The boutique Hotel Palomar Philadelphia, a Kimpton Hotel, offers an artful setting for your next Philadelphia meeting or social event. Your stay in our luxury Kimpton Hotel puts you in the heart of Philadelphia just steps from top historic cultural business and entertainment destinations. Ideally located near Rittenhouse Square the neighborhood offers an internationally renowned music scene historically rich landscape and a contemporary urban energy that attracts visitors from around the globe.